Twelve biomedical engineering students, their professor, and a former dean of the engineering school recently returned from a service-focused spring break (Feb. 28-March 7) in Guatemala City. You can read about their trip at this blog and this press release. The students are currently in Associate Professor Cynthia Paschal’s Service Learning and Leadership class. 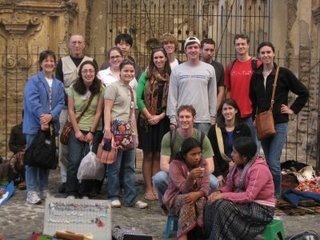 Paschal and the class also joined Ed White, dean emeritus, in Guatemala. During the week they worked in Hospital San Juan de Dios, Manos de Amor clinic and at a local school, as well as join engineering students and faculty at Universidad del Valle for a mini-conference. The Vanderbilt students delivered to Manos de Amor donated medical equipment secured by two students in Paschal’s previous fall semester service learning class, a three-credit hour course dedicated to working on service projects that could be completed in Nashville. The spring class, a one-credit hour course, offers the on-site international component involving travel during spring break. Paschal visited Manos de Amor and Universidad del Valle in May 2008 before creating the fall course. Students traveling to Guatemala City were Wade Allen, Sung Hoon Bae, Karen Baker, Jim Clear, Katherine Gray, Paul Guillod, Jessica Keener, Rosie Korman, Chris Madison, Lauren Nichols, Jessica Paulsen and Garrett Spiegel. We got to the hospital and as the maitenance workers were greeting us the head doctor of the ER and OR came in to test the electrosurgery machine we had fixed the day before. He brought with him a chicken leg and a hot dog. After testing both the coagulation and cutting mechanisms of the machine on the chicken leg, he started to thank us for fixing the machine. They hadn't used the machine for over 5 years and to have another one made another OR room adequate for more types of surgeries.